After a weak turn through the rotation, the Yankees find themselves in pursuit of a starter. Right now, the playoff rotation is Luis Severino, CC Sabathia, a hopefully healthy Masahiro Tanaka and a gigantic question mark. With that in mind, is 34-year-old veteran lefty Cole Hamels a fit for that empty rotation spot? The Cole Hamels of 2018 isn’t the same pitcher that was a top-line starter in Philadelphia from 2008-2014 (outside of 2009) and he’s not even quite the same pitcher that was an All-Star for Texas in 2016. His 4.05 ERA is only better than his rookie and 2017 seasons and his 5.00 FIP is a career worst. He’s lost a little bit of velocity and he has changed up his pitch mix (more on that in the next section). More worrisome than a losing 1-2 mph on his fastball is his control and home run issues. His K-BB rate is actually better than his 2016 All-Star season, but he leads baseball with 10 hit batters and has given up 20 home runs, second in the majors. His groundball rate has declined to 43.8 percent. If you’re looking for good news, 14 of Hamels’ 20 home runs allowed have come at home in Texas and he has significant splits home and away (5.83 ERA in 54 innings at home vs. 2.05 ERA in 48 1/3 innings away). While Yankee Stadium isn’t exactly the Polo Grounds, it’s a better environment for pitchers than Globe Life Park. Even if Hamels has been issuing meatballs, you’d expect his 20.6 percent HR rate to decline. Hamels had a 3.41 ERA heading into his last two starts but gave up 11 runs over 10 innings vs. Padres and White Sox at home. Yikes. 18 hits and two home runs in that span, though he’s also produced a 12-1 K/BB ratio at the same time. The southpaw looked sharp against the Yankees in May and has performed markedly better against teams with a .500+ winning percentage (3.05 ERA in 73 2/3 innings). He has a fine overall postseason track record, albeit he was rocked in 2016 by the Blue Jays. He has a 3.48 career playoff ERA and is 10 years removed from NLCS and WS MVP. Hamels has an impressive pitch mix in that he can reliably go to 4-5 different pitches in any count. As you can see in the graph below, he throws five different pitches at least 15 percent of the time. Four of them are variations of his fastball (four-seamer, sinker, cutter and changeup) to go with his slow curveball. He’s also experimented with a slider this year. The curveball and cutter have been his most effective pitches this season, though his changeup has suddenly gone from his best pitch to a below average offering. He’s like a lot of veteran pitchers, or current pitchers in general, and has gone away from his four-seamer, eschewing it for the cutter and sinker. It makes sense considering Hamels has seen the worst results on the four-seamer of his career. The decline in his fastball likely is related to his declining velocity. At 91.2 mph, his fastball is down 0.8 mph from last season and 1.4 mph from two years ago. His four-seamer averaged 91.2 during his sterling 2012 season, but he’s lost 2 mph off his cutter and one off his changeup in that span. Hollywood Hamels missed two months with an oblique injury last season, yet his health has been a major plus for him during his career. From 2008 to 2016, he made at least 30 starts every season and averaged 210 innings a season. He’s on pace for another 30-start, 190+ inning season this year. He missed one start with neck stiffness this season, had a minor groin issue in 2015 and had elbow surgery during the 2011 offseason. However, he’s rebounded well from each of those injuries. Hamels is in the final season of a seven-year contract that pays him a little north of $22.7 million annually. The complication here is that Hamels has a $20 million team option for 2019 (with a $6 million buyout and a vesting option that won’t vest). Hamels has a partial no-trade clause which includes the Yankees and he could invoke the clause unless a team picks up the option. One presumes the Rangers aren’t looking to simply salary dump Hamels and won’t seek relief in exchange for a lesser prospect package. While Hamels’ performance this season hasn’t been that of No. 2 starter, Texas will likely shoot for something befitting that. Rental starters with big names/contracts haven’t moved often at recent deadlines. In 2015, David Price cost a top 50 prospect (Daniel Norris) plus an upper-levels LHP and lower levels LHP. Jaime Garcia cost a lower levels starter in 2017 one trade and a solid Double-A starter that wouldn’t have made the Yankees’ 40-man roster and a Triple-A depth arm. Hamels will be somewhere in between those deals. Maybe a 2-3 player package headlined by Chance Adams? All my trade proposals are questionable at best. Hmmm… I’d lean towards no. Is he better than Sonny Gray and easier to trust in a playoff start than one of the Yankees’ rookie starters? Sure. However, I’m not convinced he’s enough of an upgrade to justify the package someone with his name and previous track record would require. He probably doesn’t slot ahead of CC Sabathia or Masahiro Tanaka in a playoff series. I’d rather stick with what the Yankees have and go for a lesser rental (J.A. Happ, anyone? ), particularly if Hamels insists on the Bombers picking up his option for 2019. For most of last week, I was in a room at a high school in Queens Village–shouts to the Hillside Avenue Wendy’s–scoring ELA Regents exams. At first, it’s a nice change of pace from the day-to-day grind that is the end of the school year. It’s fun to read other students’ writings and get a glimpse into how their teachers approach the very same things that I do day in and day out. But, of course, by the second or third day, your eyes are crossed and every word looks exactly the same and the rubric is laughing at you with the subtle distinctions between scores. So you’d think the last thing I’d want to look at is another rubric. Well, you’d be wrong, because as we inch closer to the trade deadline, it’s time to evaluate some pitching targets. The two the Yankees have been linked to most frequently–though that talk hasn’t been as fervent lately–have been JA Happ of the Blue Jays and Cole Hamels of the Rangers (hey, two former Phillies). Yes, they’ve been linked to Jacob deGrom as well, but that’s a pipe dream. I have more of a chance of successfully teaching pre-calc than the Yankees and Mets have of doing that trade. Let’s stick to more realistic options. While the Yankees’ starting pitching has been good of late, it wouldn’t hurt to acquire one more starter for the second half and the playoffs when they get here. On a surface level, they fit well. Both are lefties, which the Yankees always love, and both aren’t aces. That last point may be counter-intuitive, but the Yankees don’t necessarily need that right now and that cost would be rather high. As a quick reminder of my very rudimentary trade rubric, see below and an explanation thereof here. In terms of money cost, both are relatively low. Haap would cost just under $4.5M for the rest of the year and Hamels, if acquired at the deadline, would fall somewhere around $10-11M, depending on the date. The Yankees, per our most recent calculations, have about $13M left to play with before hitting the luxury tax threshold. Acquiring either one of these guys would leave them with room to get someone else–a reliever?–if necessary. Given that both are impending free agents–though Hamels has a club option and a buy out–they would score a 1 on the control part of the rubric, but there’s a caveat here. That’s fine for the Yankees this year. They’re not necessarily looking for a long-term piece this deadline season, but rather just one more piece to get them over the top. And both money cost and control combine nicely to help the Yankees out in player cost. Since they can absorb the money and don’t have to worry about a long term commitment, the Yankees can insist on a lower player cost. Mike outlined the potential cost for Happ here and it seems pretty reasonable. Additionally, as Mike noted, the Yankees have the prospects to win a bidding war. The cost for Hamels is less clear, of course, but it’s doubtful that his cost would be much higher. Either way, the Yankees could acquire one of these pitchers without having to give up Clint Frazier or Justus Sheffield. Improve the team and keep two of the best prospects? Yes, please. Both players have been solid performers, too. Happ has learned how to be a strikeout pitcher and has had four straight years of an ERA- no higher than 94. Likewise, Hamels–who has added a new pitch–has had no higher than a 92 ERA- in the last few years. Cole is experiencing a bit of a HR spike this year (HR/FB% of around 20%! ), but that’s anomalous and should come down, even in Yankee Stadium. Which one should the Yankees choose? 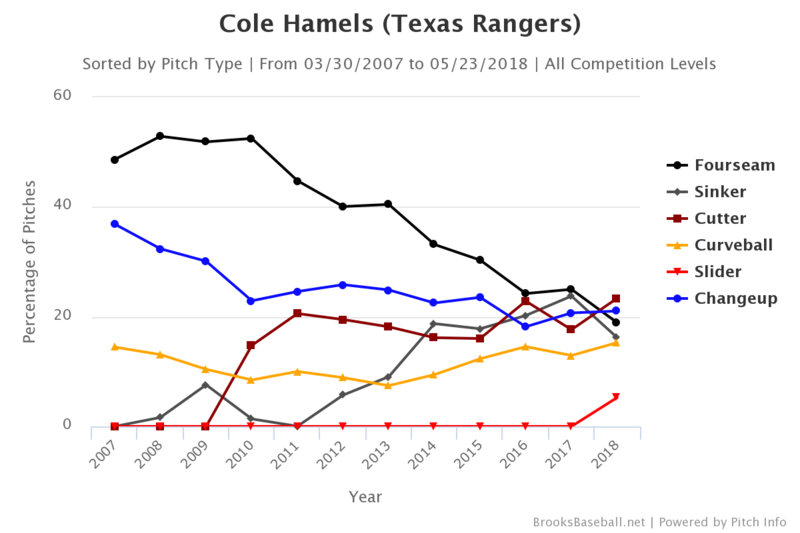 My heart–which has loved Cole Hamels since his debut in 2006 (good god, I’m old)–wants Hamels. My head says that Happ is probably the better choice, since he doesn’t have the option/buyout looming. I’ll be typical, though, and say either one would be fine. 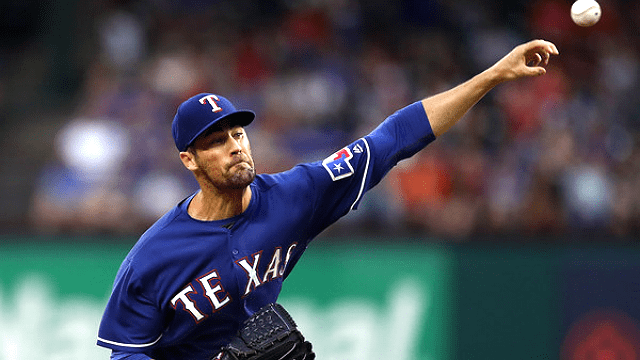 Last night, as the Yankees lost for only the fifth time in their last 27 games, we all got a firsthand look at Rangers lefty Cole Hamels, who figures to be a rather popular player come the trade deadline. He was great, holding the Yankees to two solo homers in seven innings. The Rangers are terrible though, and Hamels is an impending free agent, so it stands to reason he’ll hit the trade market at some point. The Yankees, despite all their success these last few weeks and despite having the fifth lowest ERA+ (120) in baseball, are expected to look for rotation help prior to the deadline. Sonny Gray and Masahiro Tanaka have been inconsistent at best, Jordan Montgomery is hurt, and CC Sabathia’s knee is basically start-to-start at this point of his career. Besides, there’s no such thing as too much pitching. 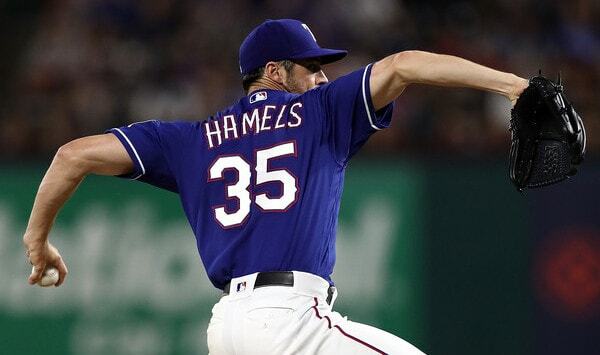 The 34-year-old Hamels has pitched well overall this season, throwing 58.2 innings with a 3.38 ERA (4.95 FIP). His strikeout (25.1%) and walk (9.0%) rates are solid. His ground ball (41.3%) and home run (1.69 HR/9) rates are worrisome. Especially since his career rates are 44.7% grounders and 1.02 HR/9. Is this an early season blip? Or is the veteran workhorse beginning to lose a little something? Over the last few weeks I’ve found myself going back and forth about Hamels as a trade target. Some days I’m for it and some days I’m against it. Hamels obviously has a strong track record and quality left-handers are always a good fit for Yankee Stadium. On the other hand, is Hamels still a difference-maker who can swap a postseason series at this point of his career? Or merely a solid starter to help get you through the season? Let’s talk this out a bit. The cutter showed up in 2010, the sinker in 2012-13, and the slider in 2018. Nowadays Hamels uses five pitches (four-seamer, sinker, cutter, changeup, curveball) fairly equally, and he’s added a sixth pitch (slider) to mess with hitters. He’s thrown 52 sliders this year, 43 in two-strike counts, and opponents have a .154 AVG and a 23.1% swing-and-miss rate against the pitch. Why has his strikeout rate bounced back this season? The slider. That’s why. The key words there: “a little bit more bargaining power.” The no-trade list allows Hamels to request something in return for accepting a trade, and wouldn’t you know it, his contract includes a $20M club option for next season. Last year’s oblique injury means he won’t reach the innings threshold required for the option to vest, but Hamels could demand the option be picked up as a condition for waiving his no-trade clause. Now, I have no idea whether Hamels wants his option picked up in exchange for waiving his no-trade clause. I’m just throwing that out there as an example of how he can leverage it into something. Having the Yankees — and two-thirds of the league — on his no-trade list does not necessarily mean Hamels doesn’t want to pitch in New York. It just means he has more control over the situation. The no-trade clause is something that has to be worked through. It’s not a definite dealbreaker. 3. Is he still a difference-maker? He looked like one last night, for sure. But we are still talking about a pitcher with a 4.95 FIP and a 1.69 HR/9 rate, and those are scary numbers. Masahiro Tanaka has a 4.84 FIP and a 1.76 HR/9 right now. I don’t get the sense many Yankees fans consider Tanaka a difference-maker at the moment, yet Hamels has similar underlying performance indicators. Hmmm. The question is not whether Hamels moves the needle for the Yankees. He does. He’s better than Domingo German at a minimum. I’d argue he’d be no worse than the team’s third best starter. In that sense, Hamels is a clear upgrade and that makes him worth acquiring. The better question, however, is whether Hamels moves the needle enough? I don’t think he’ll come cheap, even as a rental. Should the Yankees look for a better — not to mention a younger and potentially more long-term — starter before packaging prospects for Hamels? Fortunately this is not a question that has to be answered now. Unless the Rangers surprisingly rush into a trade before the end of the month, Hamels will remain with Texas for a few more weeks, as they attempt to create a bidding war before the trade deadline. The Yankees can let the market develop, see who else is out there and who else becomes available, then decide how to spend their prospects and available luxury tax payroll space. Hamels has pitched very well his last four times out (five runs in 24 innings) and he’s made those four starts against the Yankees, Indians, Red Sox, and Astros. Basically the four best teams in the American League. His performance is trending in the right direction, he has a new slider that explains the uptick in strikeouts, and he has championship pedigree (2008 NLCS and World Series MVP with Phillies). Those are all positives. The question is not whether Hamels would make the Yankees better. He obviously would. The question is whether a 34-year-old rental with home run issues is the right guy — the guy who will put the Yankees over the top — to target at the deadline. The Yankees have time on their side. My preference would be to look for a younger pitcher with more long-term upside and team control, but if that type of pitcher doesn’t become available, the Yankees can always shift gears and look at Hamels. Happy Sunday, RAB readers. I hope you’re doing well after a week mostly devoid of Yankee baseball. Luckily–at least on my end–it happened to go pretty quickly. For your content gobbling selves, I’ve got three thoughts on three Yankees: one past, one present, and one (potentially) future. Time to Move Torres Up? Gleyber Torres’s debut has been nothing short of spectacular. He’s come up and availed himself incredibly well and, as an added bonus, the Yankees have been nearly unstoppable since he was called up. Perhaps, then, it’s time to move him out of the nine spot in the lineup and up to…seventh? The Yankee lineup is beyond stacked–and has been all year–which makes moving Torres a bit trickier than normal. Who should go down below him when just about everyone is, in a vacuum, capable of being a top-half-of-the-lineup hitter? Putting Torres to seventh is probably the best option since it gives some men-on-base opportunities to Neil Walker and/or Miguel Andujar when they come up. On the flip side, the team has a good thing going with Torres batting ninth, which gives men-on-base opportunities to the top of the lineup, especially the leadoff hitter–be it Brett Gardner or Aaron Hicks–and Aaron Judge, batting second. We could argue that those opportunities–ones for better hitters–could yield better results than giving those opportunities to “lesser” hitters at the bottom of the lineup. The important thing is that Torres has hit and is showing flashes of everything at the plate: contact, patience, and power. It’s gone about as well as we could’ve hoped for and hopefully it continues to go that way. Cole in the July Stocking? 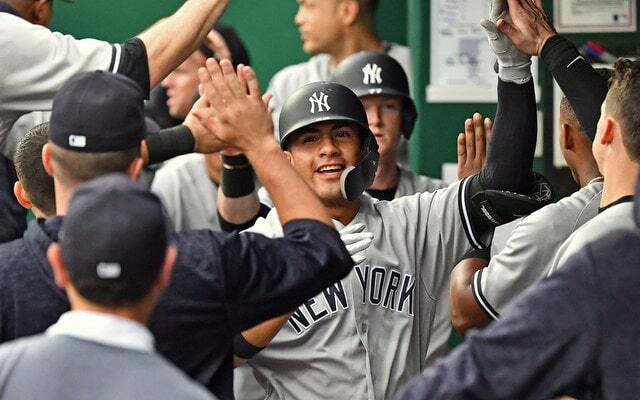 On Tuesday, the Yankees are slated to face the Rangers in game two of a three game series. 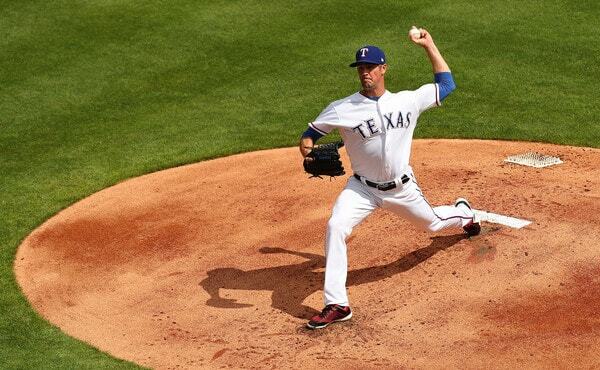 As of now, lefty Cole Hamels is the probable starter for Texas. Beyond the pitching/hitting matchup itself, this is relevant because the Yankees have recently been linked to Hamels as a trade target for this summer. A few years ago, I would’ve been pumped for this idea. Hamels has long been one of my favorite non-Yankees, but now, it’s probably too late to trade for him. Though he’s had his strikeout rate climb back up this year, his walk rate is still pushing four per nine and his home run rate is definitely too high. Additionally, his fastball velocity is–and has been–trending in the way wrong direction. For any pitcher, this is a big red flag. But for Hamels, one whose best pitch is a changeup, it’s doubly bad; that pitch can’t be as effective with minimal velocity separation. Part of this is switching to a cutter/two seamer approach instead of a four seamer, which may fit in with the Yankees’ philosophy, but unless the price is too good to refuse, the Yankees should probably pass on Hamels. Insert exasperated sigh here. 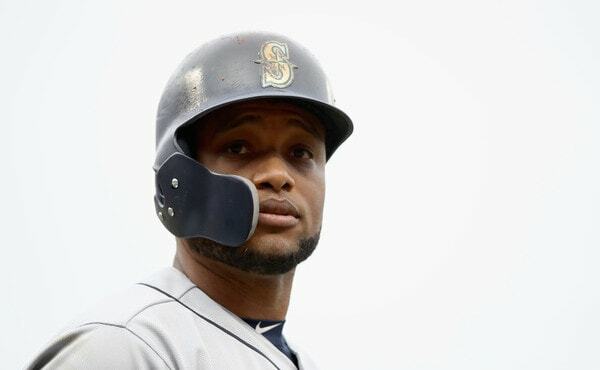 Am I surprised that Robinson Cano is suspended for 80 games? Not really. But it has nothing to do with any suspicions of him from years ago, like Mark Teixeira intimated on the Kay Show last week. It mostly has to do with fatigue and not being surprised by anyone, of any caliber, taking PEDs. I’m not angry, but it doesn’t feel all that great, obviously. I’ll still root for him from afar, though I will feel a touch of disappointment. That disappointment isn’t because of some moral judgement, but rather that this will be the discussion around Cano now, not the fact that he’s been the best second baseman in baseball for most of his career. According to Jon Morosi, the Yankees are among the teams included in Cole Hamels’ no-trade list. He can block trades to 21 teams and the Yankees are one of the 21. The Rangers are 7-13 so far and they’re not expected to contend — FanGraphs has their postseason odds at 1.6% — meaning it is very likely Hamels, an impending free agent, will be available prior to the trade deadline. So far this season the 34-year-old Hamels has a 4.76 ERA (5.22 FIP) in five starts and 28.1 innings, and he leads MLB in hits (30) and homers (7) allowed. It’s also only five starts. Last year Hamels had a 4.20 ERA (4.62 FIP) with a career worst 17.1% strikeout rate in 148 innings around an oblique injury. His strikeout rate has rebounded to 27.0% so far this year. 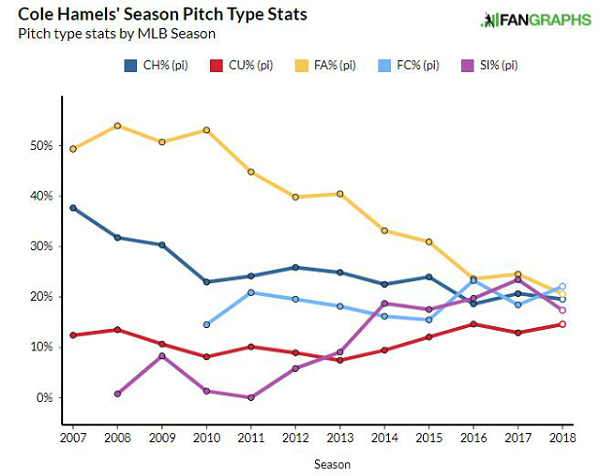 As you would expect given his age and workload — Hamels averaged 203 innings per season from 2007-16 and is closing in on 2,500 career innings — Hamels has started to lose velocity the last few years. It was down a tick last season and is down another tick this season. 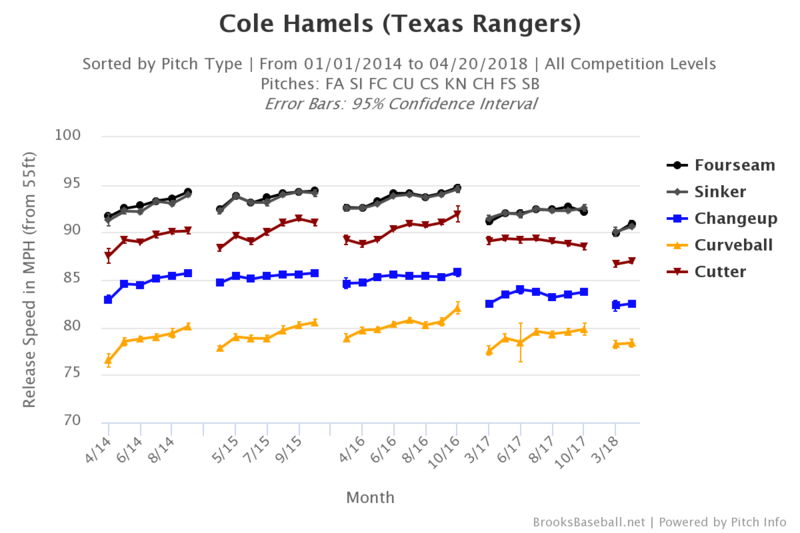 Obviously the season is still young and Hamels figures to add velocity during the summer months like pretty much every pitcher, but a workhorse losing velocity in his mid-30s is not uncommon. The good news is Hamels is still getting a ton of swings and misses on his trademark changeup. The changeup is his moneymaker. As long as that pitch is working, Hamels has a chance. Hamels is making $23.5M this season and, if the Yankees were to acquire him on the July 31st trade deadline, they’d be charged with an $8M luxury tax hit. They have enough room under the $197M luxury tax threshold to make that work. The problem is there’s a $6M buyout on his $20M option for next year, and that buyout counts against the luxury tax. Suddenly that $8M becomes $14M. Hmmm. Of course, the Yankees could always get the Rangers to eat some salary to make things work under the luxury tax threshold, which would presumably require giving up more players. Hamels is clearly in decline and my guess is the Yankees want a younger pitcher, a more long-term addition. Depending on the team’s needs come later this season, Hamels could still make some sense as a secondary rotation pickup. Think Jaime Garcia to Sonny Gray. Including the Yankees in his no-trade list doesn’t necessarily mean Hamels doesn’t want to pitch for the Yankees. Players often include big market teams in their no-trade lists because they’re the clubs that are a) most likely to acquire him, and b) best able to compensate him for waiving the no-trade clause. Maybe some team is willing to pick up his $20M option in exchange for waiving the no-trade clause. Who knows? Hamels might be able to leverage the no-trade clause into something. That’s the point. Chances are the Yankees will be looking to add a pitcher at the trade deadline and Hamels is likely to be available, so these two are going to be connected at some point. The no-trade list isn’t a dealbreaker, necessarily. It’s just an obstacle to be cleared. I don’t think it’ll take a big prospect package to get Hamels given his salary and performance, and hey, maybe he won’t be worth acquiring at all come July. It just feels like we’re heading for a lot of Yankees-Hamels rumors in the coming weeks. The race for Cole Hamels appears to be complete. Multiple reports say the Rangers have either acquired Hamels from the Phillies or are on the verge of doing so. Four prospects are heading to Philadelphia in the deal, it appears. There is also some cash involved and possibly other players going to Texas. According to Baseball America’s 2015 Prospect Handbook, the Rangers are sending their preseason No. 3 (C Jorge Alfaro), No. 5 (OF Nick Williams), and No. 13 (RHP Alec Asher) prospects to the Phillies as well as non-top 30 prospect RHP Jerad Eickhoff. A comparable Yankees package is something like Gary Sanchez, Mason Williams, Bryan Mitchell, and an extra arm. Ballpark. Not a perfect comparison. The Yankees have been connected to Hamels for weeks and months now, but, according to Mark Feinsand, they never pursued him aggressively. Given their reluctance to trade top prospects, I guess that’s not surprising. The Phillies have reportedly been asking for Aaron Judge and/or Luis Severino in return. Hamels is lined up to start tomorrow but I doubt he does given the travel and all that. The Yankees probably won’t see him. Either way, Hamels is now off the board along with Scott Kazmir and Johnny Cueto. Maybe Mat Latos too. David Price, Mike Leake, Ian Kennedy, and Hisashi Iwakuma are the top available starters now. Update: Apparently it’s a six-for-two trade. The Rangers are getting Hamels and lefty Jake Diekman (and cash) for Alfaro, Williams, Asher, Eickhoff, right-hander Jake Thompson, and left-hander Matt Harrison. Thompson was ranked as the team’s No. 2 prospect before the season. He was their Luis Severino. Just three days left now. The 2015 non-waiver trade deadline is this Friday at 4pm ET, and while the Yankees have not yet made any moves, I’m sure they will at some point in the next few days. Pitching is a bit of an issue — I’d rather not see Chris Capuano make another spot start — and second base could use an upgrade as well. Maybe another righty bat too. On Monday and Tuesday we learned the Yankees are engaged in the pitching market, both starters and relievers. They had conversations with the Reds about Johnny Cueto before he was traded to the Royals, and they were also in the hunt for Ben Zobrist before he joined Cueto in Kansas City. Final offers for Cole Hamels are reportedly due today as well. We’ll keep track of the day’s Yankees-related rumors right here.